Back in October last year, Scott Forstall was replaced by Jony Ive, and I asked the question: did iOS just get interesting again? Last night we found out, and the answer is yes. 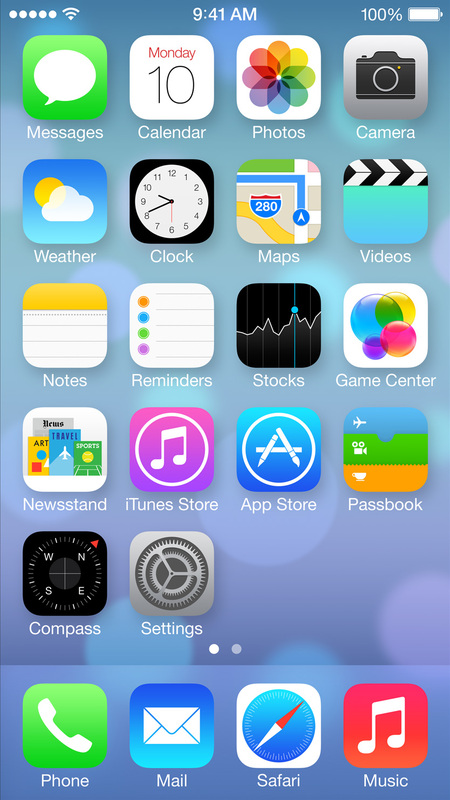 There's a lot to like about the new iOS 7. As a whole, the result looks mostly unique. There's a nice clean aesthetic going with the thin Helvetica, the white UI chrome, the sandblasted layers and the almost complete absence of gaudy textures. It's also colorful. Which is a good thing. Right? Sure, there's certainly a grid there. I was mostly paying attention to the light-source for those gradients, though: why does Phone looks embossed while Mail looks inset? Also: Game Center? Again? There will be no tears shed for the linen texture. I will not mourn the loss of green felt. Still, the new iconography alone makes iOS 7 such a departure that there's bound to be some learning curve, which begs the question: why didn't they go further now they were at it? Team! We've dominated the smartphone market for the last 5 years with a grid of round-rect icons. How do we re-think it from the ground up for the next decade? How do we create something that'll make Samsung scramble to copy us again? Perhaps they did just that. Conceivably they created giant mood-boards. Maybe they decorated hip little cubicles with smiling model faces and photos of subway signs and collages of differently colored post-it notes. Could be they brain-stormed all the places they see the mobile space go in the next ten years: creepy glasses, holographic watches, voice-controlled smart underwear. No doubt they considered the convergence of the cloud with all these new-fangled features. Perchance they arrived right back at a grid of icons: Eureka! We had it right all along! I hope that's not the case. I hope they had grander ideas… post-smartphone ideas. I'm hoping they were just so lazer-focused on shipping on time they had to punt their ideas for replacing Springboard. I'm hoping Jony felt the most important thing was to uproot the old linen-clad ways and set out a strong new direction for all future Apple UIs. I want to believe. I want to believe that maybe one day we'll have smartphones whose strongest visual cues aren't defined by the graphical prowess of 3rd party icon designers. I want to believe that maybe one day we'll look back at websites that use confirm() to alert us of their mobile apps as a dark age. I want to believe that maybe one day it'll be possible to avoid all social interaction in a manner more impressive than tapping in and out of apps. Is that so much to ask?